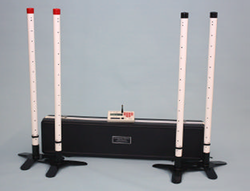 FarmTek Agility Systems are used extensively throughout the world and are renowned for their reliability and accuracy. Used for Dog Agility, Dog Flygility, Western Riding, English Riding, Motor Sports, Speed Training, etc. Their introduction to New Zealand was eagerly embraced by event organisers, competitors and spectators alike. Many systems are purchased with the aid of Charity Funding and we can offer assistance in tailoring such applications. ​Sometimes available ex stock, or 2-3 weeks delivery ex USA. High Intensity L.e.d. ring side display. Spare batteries available at Supplies. The basic unit comprises a set of start sensors, a set of finish sensors and a main console. The main console unit is powered by four aa batteries. The state of the power left in the console can be viewed by accessing the appropriate screen contained in the menu. If you don’t know how to do this, please don’t fiddle with the menu as this can create rogue settings. Each of the four sensors sit in their own steel base with a nylon thumbscrew. Care should be taken not to overtighten the thumbscrew as the thread can easily be stripped. The sensors each contain 6 industrial strength aa batteries fitted in a cartridge. There are 4 such cartridges with each set and it is wise to have a couple of spares containing brand new batteries wrapped in cling film. If a wand starts flashing for no apparent reason it is likely that the batteries are exhausted. Replace the cartridge with a cling film wrapped one and check that the wand is performing normally. Take the old batteries out of the now spare cartridge and dispose of them immediately. It would be sensible to replace with fresh batteries and re-wrapped in cling film. Care should be taken to align the battery polarity as marked on the cartridge. The cartridge has a green dot on one end and this should be aligned with the green dot on the sensor barrel. Each sensor has an on/off switch and they should be turned off between events and during the course walk. At the end of the day the battery cartridges should be removed to avoid accidental discharge. The sensors with the black caps supply the light source and it does not matter which is located at the start or finish. The red cap sensors are marked 1 for the start and 2 for the finish. They receive the light signal and transmit the information to the main console. Whenever the start and finish are reasonably close together it is important to place the two red sensors so that they face away from each other but it is most important to not let the red cap sensors face into the sun if it is at a very low angle (early morning and late afternoon) as it is possible to get a rogue signal. When the aa batteries are nearing the end of their life the coloured LED near the top of the sensor will start flashing - replace them immediately as explained above. The main console unit can be programmed for a number of functions such as Standard Course Time - SCT (and the unit automatically calculates the maximum course time - MCT). In addition it has a count-down facility to display time remaining for the course walk. Please do not attempt to alter any of the settings unless you have been instructed it the use. The units in New Zealand are set to display time to 3 decimal places as this is extremely valuable in reducing the chances of identical times. Should the scribe accidentally miss recording a time, the lower screen on the console can be used in a count back mode as the previous times are stored available for checking. Also the finish sensor can be programmed to trigger on the second or third pass should the final obstacle be also used earlier in the run. Please ask to have this changed if you are unsure. If the course takes a path back over the first obstacle the timer DOES NOT have to have the settings changed. A very helpful function is the use of the restart button at the top right of the console panel. Should the scribe hear a beep during the dog's run and the timer stops, it could be as a result of a rogue signal, but the unit has a feature that allows the scribe to restart the clock (without loss of time) such that when the dog does pass the final sensor the recorded time will be correct. This feature is not well understood but is a very important feature and it should be practised by aspiring scribes prior to officiating at a championship event. It is also most important for the scribe to look down and check the screen immediately prior to releasing the next dog to run. The timer screen must be stationary. Failure of this one act of checking is the cause of most failed times and generally happens when the previous competitor leaves the ring without their dog tripping the last sensor. This is generally the only time that the scribe will need to stop the unit using the black buton. After a normal run the previous dog's time will stay on the screen until the next dog breaks the start beam. Previous handlers are very grateful for their time to remain up for a short while if there are ringside displays in use. 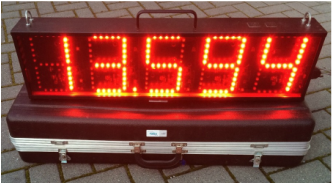 Should anyone have difficulty with a timer or display please contact Lyn Sayers on +64 29 939 7273.